1.1 What are the technical requirements for use on my PC, Mac, tablet? 1.2 Where can I use my online module? Anywhere an Internet connection is available. 1.3 Do I need to install Silverlight to use an online module? We advise you to use the HTML5 version (see "Log in PC, Apple, tablet computer"). In that case, you don't need the Silverlight plugin. 1.4 I am an Apple-Safari 7 user. What do I need to do? Click here for some important information about Apple-Safari 7. 1.5 How do I record my voice with Safari? Voice recording in these learning modules is enabled through a HTML5 Player. Recent versions of browsers such as Google Chrome or Microsoft Edge support this player. Safari users (or users of browsers that support HTML5 to a limited extent) need to activate the Flash plugin to make voice recordings. Click on the pop-up window and confirm you want to use the Flash-plugin on this type of page (with red button) each time on this website or once. 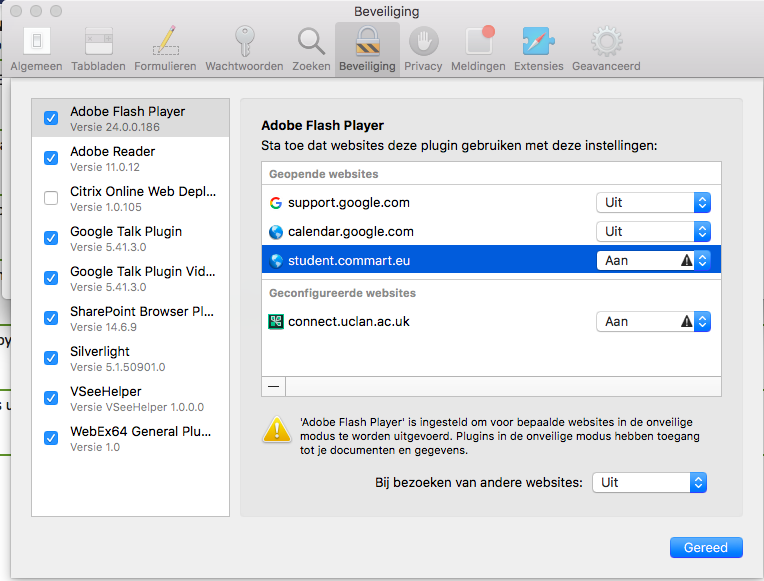 Select “On” for Adobe Flash Player plugin for website “student.commart.eu”. 2.1 Do I need an Internet connection to use the downloadable CommArt modules? You only need an Internet connection once, to install the module on your computer. After that, using the module does not require any Internet connection. 2.2 Why do I need to install a plug-in? Your web browser needs the CommArt player plugin to display the exercises and perform all interactive functionalities of the application. You can install this software by downloading and executing this file /software/CommartInstaller.zip. 2.3 Which are the (minimum) system requirements to use the downloadable CommArt modules? 2.4 The CommArt player plugin cannot be installed. You don’t have sufficient admin rights for your computer or network. If you operate in a school or company network, you will have to contact the system administrator or ICT coordinator! Select the zone Trusted sites and click on the button Custom Level. 2.5 Can I install a downloadable CommArt module on more than one computer? For each installation, you need a unique license code. Each code can only be used once. If you purchase several license codes, you can, of course, install the module on different configurations. This enables CommArt to protect the work of its authors and to generate author rights, which are needed to continue improving the modules or creating new modules. 2.6 There are white zones on my screen. Set the browser zoom (with which you can increase or decrease either the size of a web page or the size of the text) to 100%. The same goes for the font size of your Windows OS. 2.7 What is an OS (operating system), authoring software, an end-user product? An OS or operating system is loaded into the memory when you start your computer and enables other programs on your computer to work (see further in the FAQ). Authoring software allows you to create (multimedia) learning contents ,which can be published in any digital form and shared with others (via memory stick, disk, or more often the internet). The CommArt modules have been created with the authoring software EMCG developed in-house. An end user product is a finished package containing content to enable learning a language, learning how to read, gaming, etc. 2.8 What do I need to do when I get the error message: "Failed to start web browser"? Remark: PluriNF varies depending on the language combination of your module. Remark: LinguaNF varies depending on the language combination of your module. If your computer is 64-bit version, it says "Program Files (x86)" instead of "Program Files". Clicking the right mouse button on this file, you will see a menu in which you have to choose “Open with” --> “Internet Explorer”. Presumably, another browser is set as the standard browser to open such files. We advise you to use Internet Explorer to open the downloadable modules.